28 November 2016, at 12:00a.m. UK - Average pig production costs in Great Britain fell by 6 per cent in 2015, to 31.33/kg, but even bigger falls in other EU countries meant that GB costs remained among the highest in Europe. This is among the key conclusions of the latest analysis of pig production costs from InterPIG, an international group of pig economists, published today. Average EU costs dropped to £1.18/kg, with the weak euro during 2015 contributing to the fall in sterling terms. The lowest costs were again in Denmark and Spain, at £1.06/kg, while only Italy had higher average costs than GB in 2015. The decline in production costs was mainly due to cheaper feed. 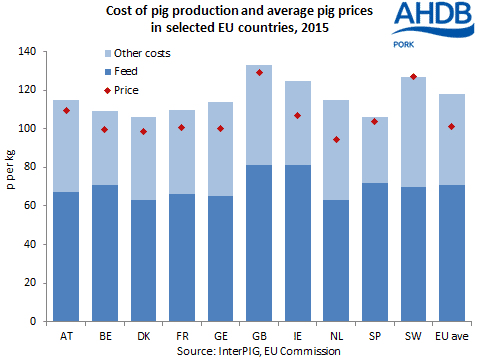 Despite this, falling pig prices meant that production costs remained above pig prices across all the main EU producing countries. Indeed, the above average pig price in Great Britain meant that producer margins were better than in most other EU countries. The InterPIG analysis also shows that productivity improved across the EU at a similar rate to that in Great Britain. The GB average of 24.4 pigs weaned per sow per year remained well below the EU average of 26.8, never mind Denmark’s 31.3. Even the UK’s indoor sows only managed a below average 26.0 pigs weaned per year. As in previous years, the main reason for the relatively low UK figure was smaller litter sizes; GB litters averaged 12.3 born alive (12.8 indoors), compared with an EU average of 13.5.